CHECK OUT THE NEWEST MEMBER OF OUR PRODUCT LINE-UP. The TAILWHEEL TRANSPORTER HD!! The TAILWHEEL TRANSPORTER HD is our most rugged model. It has TWIN 8 inch pneumatic on the front for extra stability for heavier aircraft. AND it's just as easy to use as our other models. Read on for more info! FINALLY, AN EASY TO USE TOW BAR FOR TAILWHEEL AIRPLANES!! LOOK TAILDRAGGER OWNERS! Finally, an affordable and easy to use towbar. The Patented TAILWHEEL TRANSPORTER makes moving your tailwheel aircraft on the ground easy! NO MORE bending over or getting on your knees! NO MORE strained backs and NO MORE lifting! NO MORE pulling your airplane by the flying wires or prop! Stand behind your A/C, watch both wingtips and move it around easily and safely! A great tug! Check us out today! THE TAILWHEEL TRANSPORTER ll is the best towbar available for the Van's RV line of taildraggers!! Ask someone who owns one! EXCITING NEWS!! The Tailwheel Transporter now fits RV3, RV4, RV6, RV7 and RV8! Works great with the Bell tailwheel too! The Tailwheel Transporter taildragger towbar. A new and almost effortless way to move your light tail wheel aircraft on the ground. Whether you are moving an Aeronca 7AC Champ, a Piper J3 Cub, your RV or most any other light taildragger airplane, you won’t find an easier or better way to get the job done. 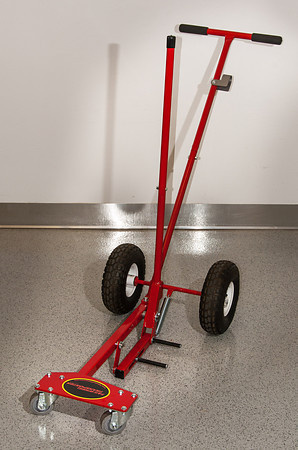 The Tailwheel Transporter attaches to your aircraft in just seconds and with only one movement of the Lifting Arm it lifts and locks the tail wheel onto an easy to handle castering dolly. There is no contact with any part of the aircraft except the tail wheel tire. No modifications to your aircraft either. With the Tailwheel Transporter airplane towbar, maneuvering your airplane in congested ramp areas and hangars has never been easier or safer. Just position the Tailwheel Transporters carrier studs around your tail wheel, pull back and lock the Lifting Arm, and in just seconds, you are ready to go! From your vantage point you can see exactly where your airplane is going! No more worry about hanger rash or damaging your aircraft’s components when moving your conventional gear airplane with the Tailwheel Transporter! Why Choose Tailwheel Transporter as your taildragger towbar? 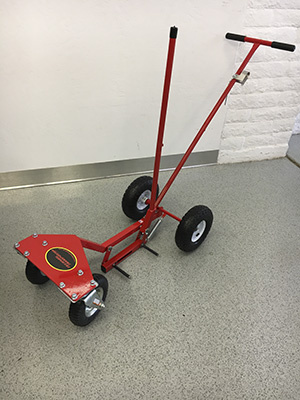 There are many different types and styles of tail wheels available, but with its exclusive moveable carrier stud, the Tailwheel Transporter is easily adapted to fit all different types and sizes of tail wheels. In just a moment the Tailwheel Transporter is easily adjusted to accommodate almost any size tail wheel, from all the popular Scott, Maule, Lang, RV and Raven tail wheels to the smaller solid rubber tires used on many of today’s homebuilt airplanes. The Tailwheel Transporter airplane towbar is a quality built product and will give you years of trouble free service. It is proudly made in America using heavy duty welded steel construction and quality hardware and components and has a rugged, powder coated finish. 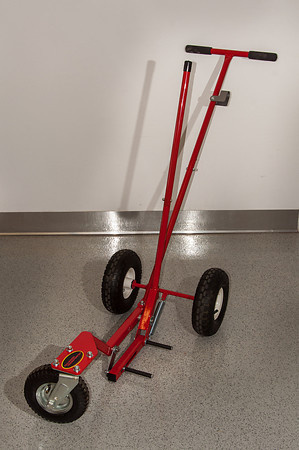 It uses pneumatic tires allowing it to work well on uneven surfaces and has been tested on airplanes with tail wheel weights of up to 200 pounds! The Tailwheel Transporter is better and easier to use than any other aircraft towbar or aircraft tug! Which Tailwheel Transporter Should I Buy? Now there are three models of the Tailwheel Transporter for you to choose from. All have been totally redesigned and have new features that make them easier to use than ever. 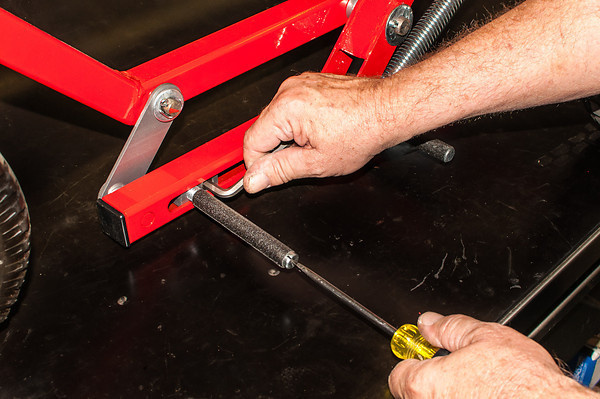 First, we increased the mechanical advantage of the Lifting Arm, making it easier to lift and latch. We lowered the Pushbar to make it more comfortable to use and we redesigned the Lifting Foot to provide a level lift, which makes it compatible with many more types of aircraft. The Tailwheel Transporter l is a perfect match for Piper Cubs, Aeronca Champs and other aircraft that have at least 10.5 inches of ground clearance where the tail wheel spring is mounted to the fuselage. We recommend it for aircraft weighing up to 900 pounds or so. The Tailwheel Transporter ll has all the new features of the original style plus it only requires 4.75 inches of ground clearance, making it the perfect towbar for RV taildraggers and many other similar aircraft! Our newest model, the Tailwheel Transporter HD just what you need for aircraft heavier than 900 pounds. With two large 8 inch pneumatic casters on the front it gives you that extra stability you need! The Tailwheel Transporter HD also requires 10.5 inches of clearance where the tailspring is mounted to the fuselage. Order your Tailwheel Transporter l or Tailwheel Transporter ll for only $399.00 plus shipping or the new Tailwheel Transporter HD for only $439.00. ORDER TODAY WHILE THEY LAST! !